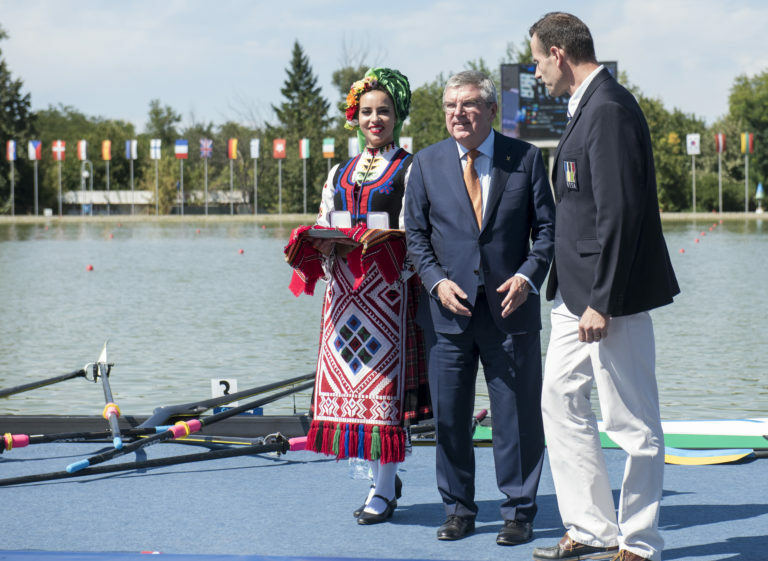 The timing of President Bach’s visit to the Plovdiv regatta centre could not have been better: it overlapped with the lightweight double sculls A-finals which he watched from the grandstand. 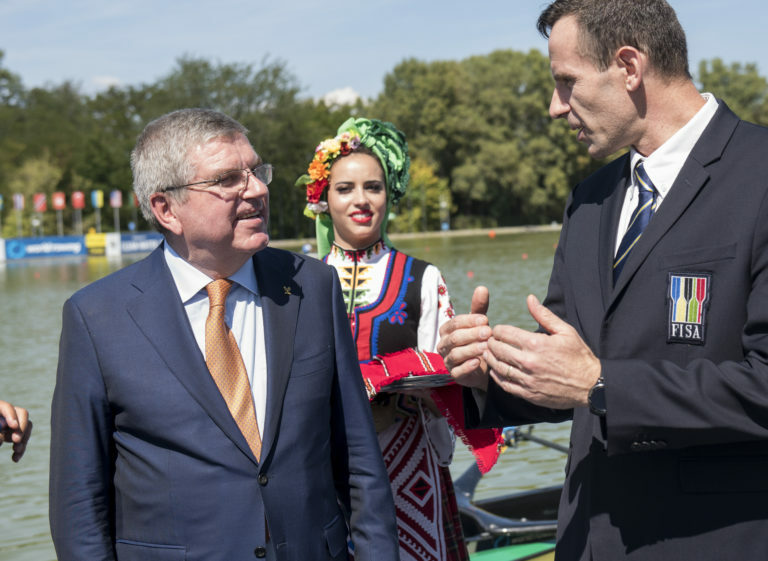 No doubt FISA pushed quite hard to make sure it was Saturday 15th September when the German-born IOC President visited, not Sunday 16 when German men’s eight will be defending their world title. Photo Bach with Rollande on the medal dock in Bulgaria. Bach professed himself delighted with the LW2x and LM2x. “I always like to be at rowing and in particular on a day like this, seeing some exciting races,” he said. However, talking privately with journalists later, his tone was cautionary and certainly gave no comfort to those worried about the IOC’s stance on lightweight rowing, which is that weight categories are irrelevant and unnecessary in a non-contact sport. The problem is that the IOC is probably going to force FISA to do its dirty work for it. International federations aren’t usually told what to put in their programmes, they’re just quietly made aware that in the cases where the IOC has a reason to dislike an event type on principle, it will damage the credibility of their proposed programme to include it. Who knows what threats have been made behind closed doors to rowing IOC’s members if they insist on keeping the lightweights — drastic reductions in rowing’s already-bloated numbers, more pressure to reduce the expensive 2km lake length or to join the growing band of sports which have created mixed team events after the main attraction? As Bach said, the pressure is not only on rowing, and with many new sports and new disciplines within sports being considered, yet the athlete, event and team quotas remaining static, no medal can claim a right to remain constantly in the Games programme. All of the above options are likely to come onto the scene at some point anyway due to the wide-ranging Agenda 2020, which has created a situation in which no sport, no discipline and no event feels safe. Bach’s vision allows the IOC to use the lever of looking at the overall programme, with the impact of an event measured in a complex multi-way balance between cost and viewing, team numbers and environmental impact, legacy and development, universality and entertainment value. Drop on even one of those (and rowing is numerous, expensive and not the most universally popular sport) and it becomes a sticky situation. Conversely those sports which are quickly embracing the core Agenda2020 changes (not just gender equality but particularly mixed events, cheaper and better-legacy venues and more spectator-friendly spectacles) are earning speedy brownie points. Rowing has gone gender-equal, which may have seemed like a big change at the time, but it turns out to have been the absolute minimum at this stage that the sport could get away with. There will be no easy way out of this tightening channel, and lightweight rowing is only part of the argument for rowing, which may have several more Olympiads in which it is being steadily coerced to change and ‘modernise’. 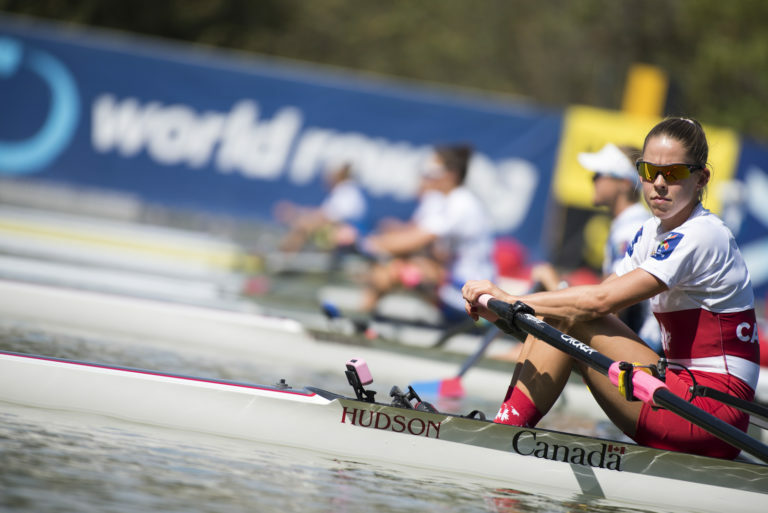 Changing the LM4- for the W4- is only the beginning. 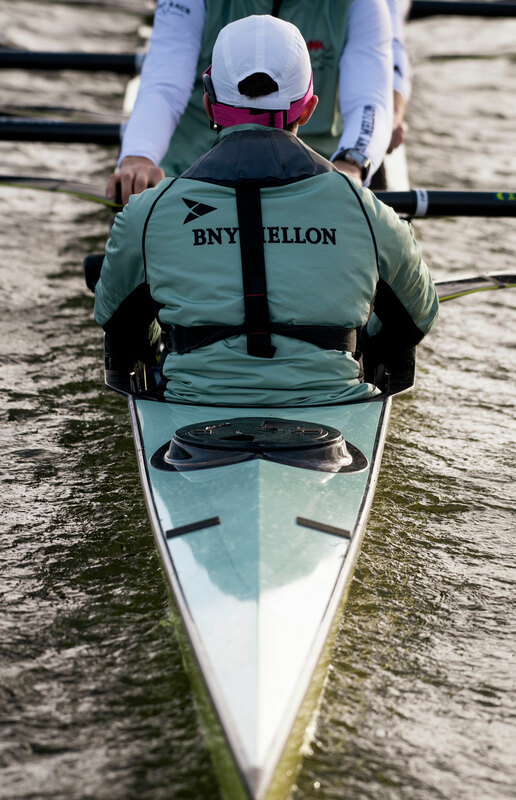 All the action from the 165th Boat Races on the Tideway in London.